Elite Syrian troops moved into east Aleppo Thursday ahead of a push into the most densely populated areas, as regime ally Russia called for corridors to bring in aid and evacuate wounded. Despite global criticism including the UN warning Aleppo risked becoming a "giant graveyard", government forces have pressed an assault to retake control of the divided city. The offensive -- backed by artillery -- has spurred an exodus of tens of thousands of residents from the rebel-held east. It has left Aleppo's streets strewn with the bodies of men, women and children, many lying next to the suitcases they had packed to escape. Artillery fire continued on Thursday but subsided as heavy rainfall hit the city. The assault has seen President Bashar al-Assad's forces make significant gains in the last week. "The regime is tightening the noose on the remaining section of east Aleppo under rebel control," Observatory head Rami Abdel Rahman told AFP. He said hundreds of fighters from the elite Republican Guard and Fourth Division arrived in Aleppo on Thursday "in preparation for street battles" in the densely populated southeast. The violence in Aleppo has sparked widespread outrage at the regime, but also at its steadfast supporter Moscow. On Thursday, Russia proposed setting up four humanitarian corridors into east Aleppo to bring in aid and evacuate severely wounded people. 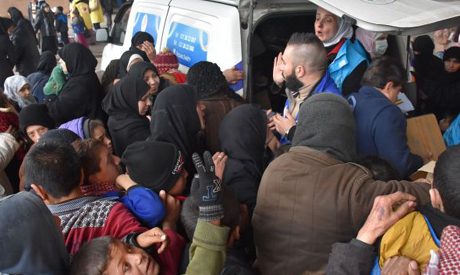 Russia announced "they want to sit down in Aleppo with our people there to discuss how we can use the four (humanitarian) corridors to evacuate people out," Jan Egeland, head of the UN-backed humanitarian taskforce for Syria, told reporters in Geneva. He said Russia has pledged to respect the corridors, and that "we (the UN) now feel confident that the armed opposition groups will do the same." Moscow has announced several humanitarian pauses in Aleppo to allow civilians to flee, but until the recent military escalation, only a handful did so. In Turkey on Thursday, Russian Foreign Minister Sergei Lavrov said Moscow had used every opportunity to help civilians, but accused rebels of threatening "to prevent passage of humanitarian convoys and fire on them." Russia was criticised at Wednesday's UN Security Council meeting on Syria, with British ambassador Matthew Rycroft accusing Moscow of supporting "a deliberate act of starvation and a deliberate withholding of medical care." Since Saturday more than 50,000 people have poured out of east Aleppo into territory controlled by government forces or local Kurdish authorities, according to the Observatory. Thousands more have sought refuge in the remaining rebel-held neighbourhoods in southeastern Aleppo, arriving with overpacked suitcases or sometimes just the clothes on their backs. The loss of east Aleppo -- a rebel stronghold since 2012 -- would be the biggest blow to Syria's opposition in more than five years. The city became a powerful symbol of Syria's uprising, producing some of the war's most iconic images including of Omran, the shell-shocked toddler in an ambulance. Syrian aircraft have been pounding east Aleppo with air strikes for months -- often using crude munitions like barrel bombs -- but as the ground advance has gathered pace the army has instead turned to more precise artillery. The effect has been no less devastating. The government's offensive has left 42 children dead, among a total of more than 300 civilians killed since November 15. Speaking to a special Security Council session on Wednesday, UN humanitarian chief Stephen O'Brien made an urgent appeal.